Budget VPS solutions continue to rise in popularity and have begun to garner mainstream traction. As server and cloud technologies improve in both functionality and performance, this trend is only expected to continue – and rightfully so. There are a vast number of reasons why an organization would opt to host their website or application on a budget VPS. Compared to standard shared hosting packages, VPS’s are much more reliable. The problem with shared hosting lies in the fact that many companies over use their shared servers in an effort to pile on as many customers onto a single server to save money. And since hundreds to thousands of websites are being hosted on any given server, any one of those websites can impact your own site’s performance. This means that any schmuck with some free time and programming skills can choose to crash the server, negatively affecting your website’s speed, functionality, or taking it offline altogether. So if you’re website is used for business and you’re on a shared hosting plan, you’re just asking for a headache. The use of Eco-friendly technologies within the web hosting industry has gained much popularity over the past several years. VPS hosting uses its resources more efficiently, leaving behind a small carbon footprint. This is because a virtual private server uses a large dedicated server divided into different virtual environments. This allows many people to benefit from a single server’s resources and power consumption. What’s so advantageous about containers is that they can be quickly given more resources as needed. For instance, if you’re running a new advertising campaign and expect a large influx of traffic, you can easily add more RAM with a few clicks. With shared hosting plans, you would have to wait for the RAM to be physically installed onto the server by the hosting provider. This would result in lost traffic and revenue. Is that a risk you’re willing to take? VPS hosting solutions are much less expensive compared to only a few years ago. Advancements in virtualization technologies will only help lower VPS costs. Because of this fact, VPS are a logical option for companies and websites of all sizes. Some budget VPS solutions cost less than $10 a month, which is just as cost-effective as regular shared hosting plans but without the risk. Chances are once you decide to make the switch to a budget VPS solution, you’ll never look back. Quality VPS providers will make server management and control a simple task. Based on our research, here are the top 10 budget VPS providers on the market – ranked with both cost and quality in mind. HostGator’s virtual private servers come with full root access for total environment control, custom installs, and RAID 10 disc configuration for maximum data protection. Resources can be easily scaled with the click of a button and HostGator courteously performs a weekly backup of your website’s data free of charge. HostGator is an award-winning hosting provider whose services rival that of their largest competitors. Their VPS costs run a little on the high side, but by using HostGator you know you’re getting reliability and are guaranteed to experience little to no downtime. TMDHosting utilizes the latest solid state drives (SSD) for smooth performance and ultra-fast loading times. Information is protected thanks to TMD’s senior system administrators who regularly update their firewall. Free daily backups are also included with their budget VPS plans. Overall we found TMDHosting to offer excellent fully managed VPS plans. Although their prices could be a little better, they use the latest technology and have variety. InMotionHosting VPS packages run on the latest Linux SSD servers. Each plan comes with free server management and CentOS with LAMP stack, which would make these VPS servers a great option for designers and developers. InMotionHosting loses points for only offering Linux servers. But they more than make up for it with the fact that each VPS plan is not locked down to a certain number of CPU cores, which is rare. We also like that each VPS plan comes with an unlimited number of email accounts and allows an unlimited number of websites and domains. 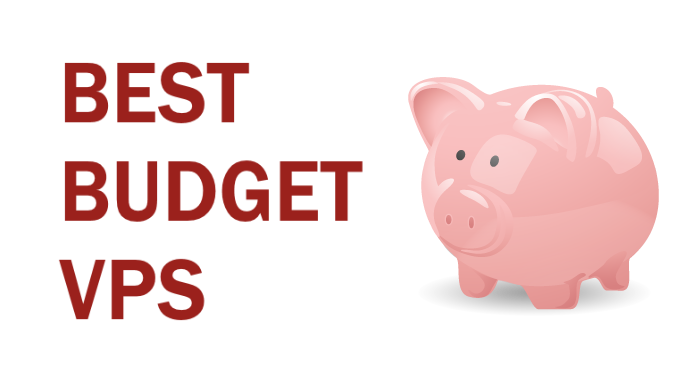 HostMonster has been in business since 1996, making them the oldest budget VPS provider on this list. Their VPS servers utilize the latest cloud technologies like OpenStack and KVM hypervisor virtualization, which guarantees any resources you purchase will always be available. Prices are decent, packages are good. Our only complaint lies in the fact that their CPU cores are limited. But for just $20 a month, HostMonster’s Standard VPS plan is a great option for new and smaller websites. HawkHost is a newcomer to the web hosting industry and offers a number of effective hosting solutions. Their budget VPS SSD servers are powered by RAID10 and plans are applicable with CentOS, Debian, Ubuntu, and Fedora operating systems. We were a little disappointed with HawkHost’s VPS plan specifications. The RAM and disk space that comes with the Super plan just doesn’t justify the costs. We advise larger well-established companies to use a different VPS solution with larger capabilities, but smaller websites are perfect for the Basic VPS package. It is also unfortunate that you must pay $10 a month for cPanel access, but they do offer their own proprietary panel solution. DreamHost is another dominating player in the web hosting industry. While they’re well-known for their reliable WordPress web hosting and cheap domain names, most people overlook their budget VPS hosting solutions. DreamHost makes it easy to increase RAM through their simple to use control panel. We also like their unlimited bandwidth policy. The only downside lies in the fact they only include 1 IP address for all plans. Other than this, their budget VPS are great for small websites, growing businesses, and everything in between. THCServers runs through advanced data centers in the US, Canada, and Europe. They offer both Windows and Linux VPS hosting solutions, though the prices are essentially the same, and each plan comes with full root-level control. Even though there are some discrepancies in their Linux and Windows VPS plans, they were each balanced with near equal amounts of RAM and storage. For 2 CPU and 2 GB RAM at just $15 per month, THCServers Windows VPS plan is definitely a bargain worth noting. DotBlock is owned by its sister company HostRocket.com, and it’s one of the few budget VPS providers on this list whose focus is solely on providing VPS solutions. They offer managed and unmanaged VPS plans equipped with a host of pre-installed application stacks, which includes cPanel, DotBlock AMP, and Virtiualmin. Based on our research and experience using DotBlock, we think it’s safe to say this is arguably one of the best VPS hosting company’s on the planet. And if you don’t believe us, feel free to check out their $1 trial. By checking out our other web hosting lists you probably understand HostWinds is well-known for their incredibly low prices. Their budget VPS solutions are no different. HostWinds offers SSD and HDD VPS solutions to both Linux and Windows users. All VPS accounts come with unlimited bandwidth. While HostWinds certainly offers a diverse number of budget VPS plans, and even though they have prices that beat that of other providers on this list, we feel they fell short when it came to core, RAM, disk space and speed. TMZVPS is another hosting provider whose sole focus lies in providing quality VPS services. They offer both managed and unmanaged SSD and HDD VPS solutions using servers based in the US and across Europe. Just glance at the VPS prices and specifications for each provider on this list and tell us there’s not a glaringly obvious difference between TMZVPS and all the others. Every penny spent on their VPS services is spent well, and there’s not many companies using the latest technology at such a high standard for such low prices. Highly recommended budget VPS provider.